This solo task is the first in a series of six. It begins with Dedire Harath (click for map image) on the zone-in level of the Tower of Rot. Say "help" to get the task. - Speak with Brendaleen, Quincy, and Kentash. - Get explore updates on the floors above and below the zone-in level. 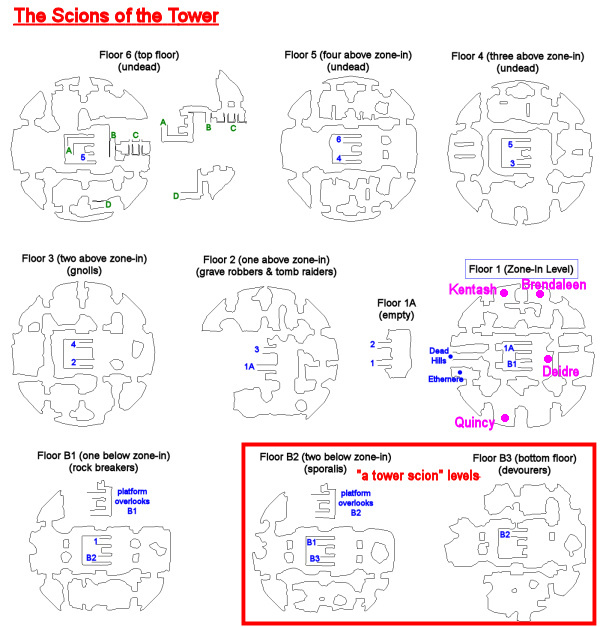 - Kill "a tower scion" mobs (bottom two floors) until you get an update. You have been assigned the task 'The Scions of the Tower'. The Tower of Rot is under the control of Kyle Bayle, but a group called the Scions of the Tower are seeking something inside of it. Deidre Harath and the other people ripped from around Qeynos by the portals there are now trapped inside the tower. Find out more by speaking to the others and exploring the tower. Deidre Harath glares at her surroundings. Deidre Harath mutters to herself about the undead. Deidre Harath calls out to one of the Qeynos guards and orders a patrol of the perimeter. Brendaleen Thundershield looks around. 'This place. Not the nicest ancient ruin I've plundered. If you want the boring history details, talk to that scholar, Kentash. If you want to help me look for treasure and find a way out for us, well, then we can talk.' She smirks. Brendaleen Thundershield appears to be going over a rough map for the Tower she's sketched out. Brendaleen Thundershield starts digging through her sack of treasures and trinkets. Quincy Hollows tugs at his beard, frowning, appearing to be deep in thought. For the explore steps, just run around on the noted levels until you get updates. 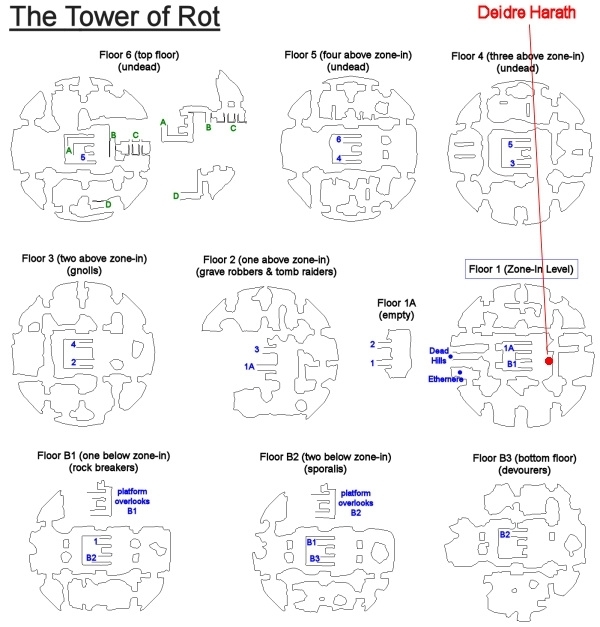 For the scion step, kill mobs called "a tower scion", located throughout the bottom two floors (the second and third floors down from the zone-in level). These mobs hit for a max ~17,500 and summon when damaged. This is an uncommon kill update, so it may take several kills before you get it. a tower scion grins, thirsty for blood! a tower scion has been slain by _____! a tower scion's corpse falls over dead. a tower scion had nothing of interest on them. You may need to find a different Scion in order to find some useful information. a tower scion had a document on them. You take it for Deidre and the others. You've explored the Tower of Rot and started gathering information about the Scions of the Tower. Today our group of six each had task updates on the first scion kill. The trash of all types doesn't see thru double-invis... except for the mucks and the sperms. There's one in every crowd, eh?! Had to kill 11 scions to get 6 updates. A good spot, with 3 scion static spawns, is on the first level below ground, to the right as you exit the down ramp. Watch for the one see-all-invis muck. all updates are at the first entry level. Only this one needs to wander around in the area where the furniture and the ghosts are.